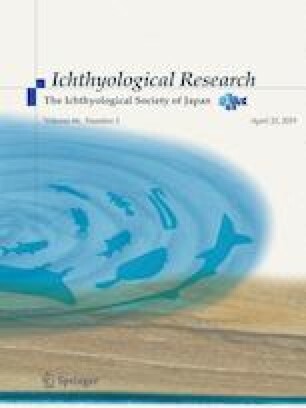 Physical substrates in the rearing environment can influence the early survival and feeding patterns of captive-reared fish. In this study, we determined whether substrates affect the survival and growth of hatchery-reared silver therapon Leiopotherapon plumbeus larvae as well as examined their prey selectivity and diel feeding cycle. Newly hatched larvae [1.92 mm total length (TL)] were reared for 40 days in triplicate 4 m3 tanks with or without tropical almond Terminalia catappa leaves as substrate. Prey selectivity of larvae reared in tanks with substrate for 35 days from the yolk-sac stage was measured by the Chesson’s selectivity index (αi). Diel feeding cycle of 3-4 days post-hatch (dph) silver therapon larvae reared in tanks exposed to natural light cycle and fed wild zooplankton was also studied. Larvae reared in tanks with substrate had significantly higher survivorship (48.44 ± 7.85%) than those reared in tanks without substrate (26.73 ± 1.60%). However, total length, specific growth rate and body weight of silver therapon larvae from tanks with or without substrate were not significantly different. Silver therapon larvae are generalist predator, demonstrating a degree of prey selectivity in some prey items during early ontogeny. Prey selectivity of silver therapon larvae varied during larval ontogeny, with higher Chesson’s selectivity index for copepod nauplii among the smaller fish larvae (2–5 dph; 2.94–5.17 mm TL), cladocerans (Moina micrura and Bosmina coregoni) among intermediate (6–11 dph; 5.72–9.60 mm TL), and ostracod, cladoceran and insect larvae among larger fish (12–35 dph; 10.28–20.96 mm TL). Larvae showed a diel feeding cycle where they actively fed during daylight hours, with a peak in the late afternoon, and reached a minimum at dark. Together, these findings advance our understanding of the feeding predatory behavior and efficiency of silver therapon larvae and preference for tanks with substrate that improve their survival. This study was funded by the SEAFDEC Aquaculture Department (Project Nos. Nr-01-F2013B and Br-02-F2015B). The authors are grateful to NB Olorvida for his assistance in the conduct of the experiment. Handling of fish specimens complied with existing regulations of the Philippines.